Around the turn of the 19th century two brothers of the John Bowman family, Edwin and Arthur and their families, decided to try their luck in Queensland, and moved to Brisbane with their families. Hilda Brooks nee Troedson, a descendant of Edwin living in Brisbane, recalls her mother saying Edwin (seen here) suffered from a respiratory health complaint and his doctor advised moving to a warmer climate – that perhaps was the primary motivation for the move. We know contact was maintained between the Victorians and the brothers and their families up until at least the 1950s – our cousin Mike Wilson recalls visiting them when he was a lad in that era. But thereafter contact ceased and was lost until a member of the Edwin Wilson family living in Melbourne, Corry John Wilson (known as John), in the process of researching his family history made contact with Shirley Davies in 1996. John was able to provide copious information on all of the descendants of Edwin. Subsequently, through contact with John’s immediate relatives, coupled with image discoveries from Flo Bubb’s Trunk (see later story), we were also able to piece together what had become of Edwin’s brother Arthur seen with his family below: those in the image are parents Arthur and Elizabeth nee Sonnenberg and children. The image dates to about 1914/15. Sadly the marriages of both Edwin and Arthur failed and they each went their own ways, some of the children remaining with one parent some with the other. John Wilson and other members of the research team have spent many hours over several years searching to find out what became of Edwin’s former wife Annabella nee Cavell, without success up to 2019. We are not even certain if we have a photograph of Annabella – the image here is suspected of being she but not yet confirmed. Of Poetry and Pineapples – one story in the Melbourne based families which persisted for some years was that Arthur’s family engaged in growing pineapples, but it appears they may only have had a plant nursery near their home in Vulture Street, Brisbane – maybe they sold a few pineapple plants too. The Queensland Picnic – The image below was discovered by our cousins, sisters Karen Roe and Glenden Andrews during their early 2010 visit to Brisbane when they visited descendants of Edwin Wilson. Karen has identified as many as possible of those present in the image. Many thanks to Karen and Glenden for their great research work in this discovery. We have converted the marked up image from a print into pdf format in order to get it into a form which is as clear as possible, and, suitable for download with the ID’s which Karen has added as part of the image. We wonder might the picnic have been on Edwin Wilson’s farm which was located near Maleny, Queensland. Edwin’s farm is believed to have involved dairying and possibly with some horticulture such as banana farming. Karen and Glenden’s grandmother Catherine, 3rd child of Edwin features in another image which may be opened in the image gallery below. It is one of the very best images in our collection of our families of old. 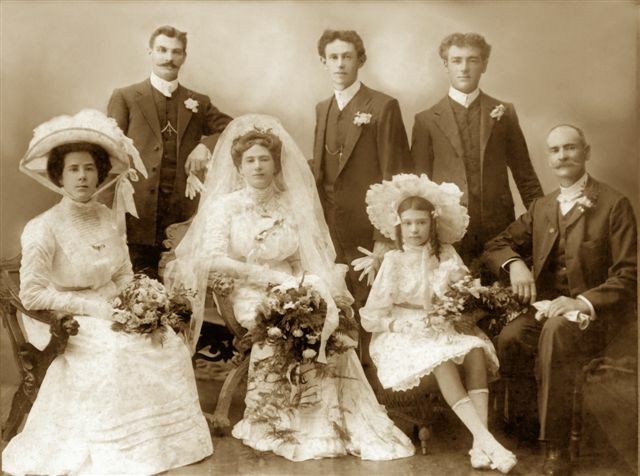 This wedding group features the following members of the Edwin Wilson family – those appearing are, Back Row of men standing – Jack Little (best man), bridegroom Ernest James Wilson (no relation), Albert Corry Wilson (Corrie) (Catherine’s brother); Ladies seated – Catherine’s youngest sister Lilian May Wilson, Catherine Frances Wilson (bride), Catherine’s sister Eileen Hazel Wilson; Man seated – Edwin Wilson, father of the bride. A second image from Karen & Glenden’s discovery shows a close up view of Elizabeth Sonnenberg, former wife of Arthur, and one of her daughters, Gladys nee Wilson. Gladys who suffered from Polio in her younger years was later to marry her first cousin John Harold Theodore Wilson (known as Theodore) who was one of Edwin Wilson’s sons. Theodore appears in the picnic photograph and in his Light Horse Regiment uniform below. They did not have children, and as the other two siblings did not marry Arthur and Elizabeth’s line came to an end. The gallery images feature a set of gold ear-rings still held by Hilda Brooks nee Troedson, grand-daughter of Edwin Wilson, passed on through him from his mother Agnes Eliza. The surface is embossed with common Australian fauna and flora. Of Edwin and Annabella’s children we now have photographs of most but not all – there is a distant identified image of Herbert Clarence in the picnic group, and we are yet to locate images of Elma Gladys and Olive Celeste. Gold Earrings belonged to Agnes Eliza (McDonald Smith) from gold won by John Bowman. Was the gold from the Table Hill or Tubbarubba Fields ?